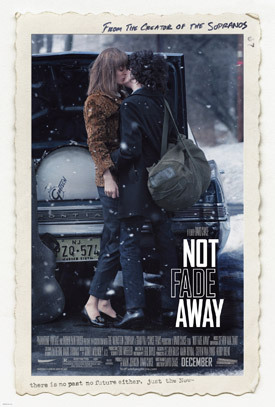 Watch the Movie Trailer for Not Fade Away. John Magaro, Bella Heathcote, Jack Huston, Will Brill and James Gandolfini star in the music drama written and directed by The Sopranos creator David Chase. The film follows three best friends, Douglas (Magaro), Eugene (Huston) and Wells (Brill), from New Jersey who form a rock band after seeing The Rolling Stones make their U.S. television premiere in 1964. MPAA Rating: (R) for pervasive language, some drug use and sexual content.